Here he is, “that gallus old codger,” as Damon Runyon would write some ten months later: 52-year old Daddy Browning at the time of his engagement to 15-year old Frances “Peaches” Heenan. Look at the evil mug on the chap ! And what are those bandages and scars on Peaches’ face, neck and arms? 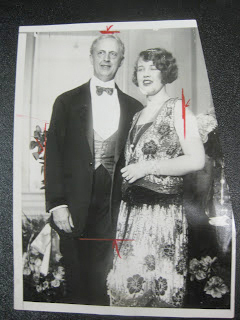 It’s March or April, 1926 (the couple was married on April 10th) and mobs of reporters had been following them around for many weeks already as Daddy took his not-so-little girl shopping on Fifth Avenue in his rented, chauffered peacock-blue Rolls Royce. Something went very WRONG, though (perhaps a Lothario appeared at her door, at least closer to Peaches in age than the old satyr?). One night an intruder entered Peaches’ boudoir through an un-locked fire-escapte window and splashed acid on the girl’s face. A very neat job it was: no stains on the bedclothes, no signs of a struggle or forced entry. Daddy Browning rushed uptown when he heard the news and convinced Peaches’ mother to keep the police out of it withhis promises to secure all requisite medical care. What were his motives and who really dunnit? Res ipsa loquitur, so I say….